I confess that I don’t often bake with whole wheat flour. I think that’s due more to habit than taste. 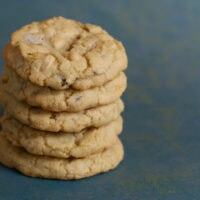 But, it can be a great substitute for traditional flour in many recipes, like this one. 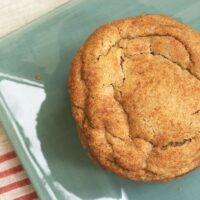 I am fairly confident that if you tasted one of these without knowing the list of ingredients, you’d never guess that they are made with whole wheat flour. 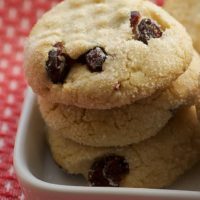 In fact, of all the cookies in my recent baking memory, these are probably in the top 10. 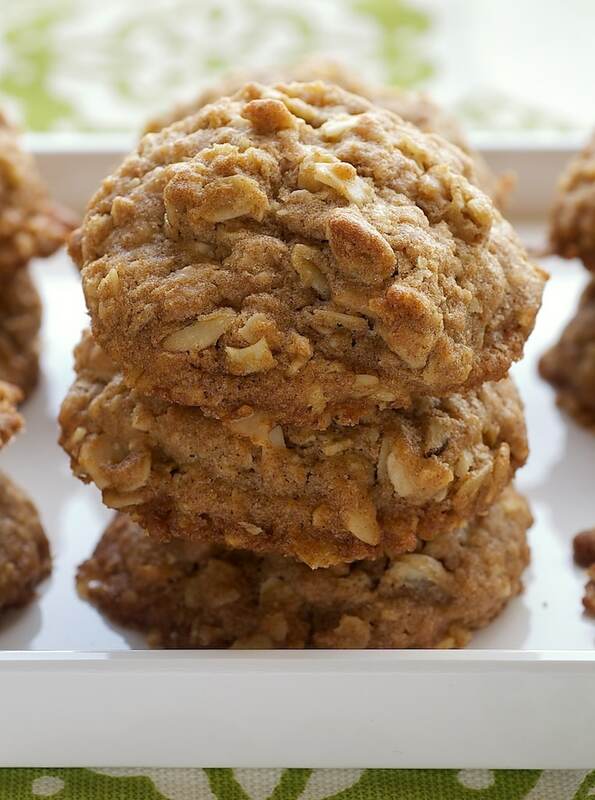 These cookies are everything I love about oatmeal cookies – lots of oats, brown sugar, and cinnamon. 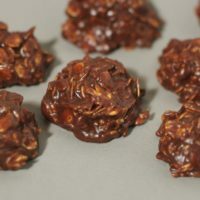 For some added interest and crunch, I tossed in some toffee chips and toasted almonds. Pretty tasty, if I do say so myself! 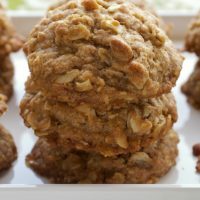 Plenty of oats, brown sugar, and cinnamon, along with toffee bits and toasted almonds, make these Toffee Almond Oatmeal Cookies a winner! Whisk together the flour, baking powder, salt, and cinnamon. Stir in the oats. Set aside. 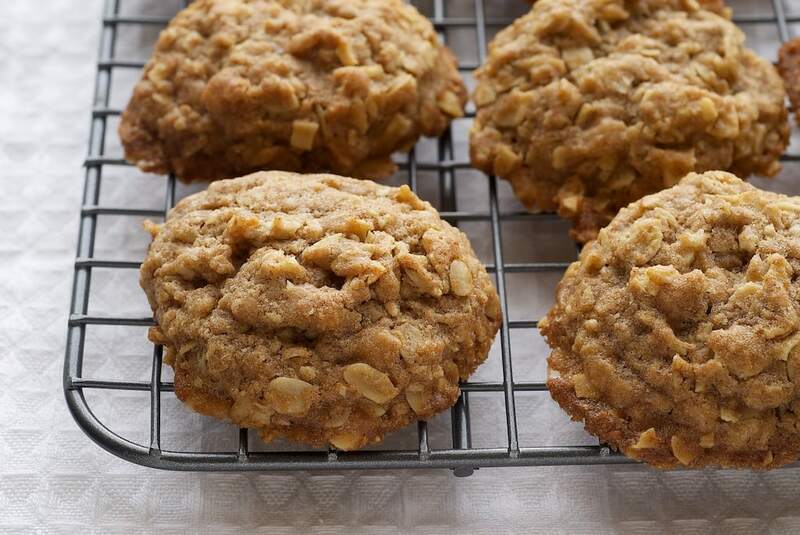 Using an electric mixer on medium speed, beat the butter and brown sugar until fluffy. Add the egg and vanilla, and mix well. Gradually add the flour mixture, beating just until combined. Stir in the toffee bits and almonds. Drop dough by tablespoonfuls onto the prepared baking sheets. Bake for 12-15 minutes or until lightly browned. Cool on baking sheets for a few minutes. Then, remove the cookies to wire racks to cool completely. I LOOOOOOOVE toffee!!! Where’s the recipe??? Laura, there’s a link to the recipe above the top photo. They sound delicious — are they chewy? Courtney, they are a little crispy on the outside, and chewy on the inside! Looks delicious! 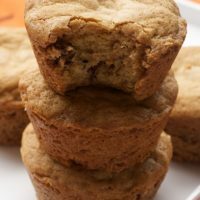 Do you replace whole wheat flour with equal amounts of AP flour? Have nothing against whole wheat, just don’t want to add another flour to my already large collection! Hi, Lorry. You can substitute all-purpose flour, but you may need to reduce the amount of flour. I’ve not tried the substitution in this recipe, so I can’t give you a definitive answer. I would suggest to add all but a couple of tablespoons of flour and then decide if your dough needs the remaining flour.